Mom in Two Cultures: The Dilemma--This is Serious! Pink called me on my cell when I was running errands today. She calls out of the blue a lot, and it never ceases to surprise me. Sky has never showed any interest in the phone--he doesn't answer it if it rings, and he would prefer to do just about anything but talk on it. Only recently did he manage to remember my number. For Pink, however, figuring out how to call me on the phone was a bit like discovering the Holy Grail. She calls me ALL. THE. TIME. A few weeks ago, when I left early for a six-hour drive to give a conference paper, Pink called me four times before I reached the next town. Today she called me with a question about her homework (even though Ren was in the next room and would have been more than happy to help). 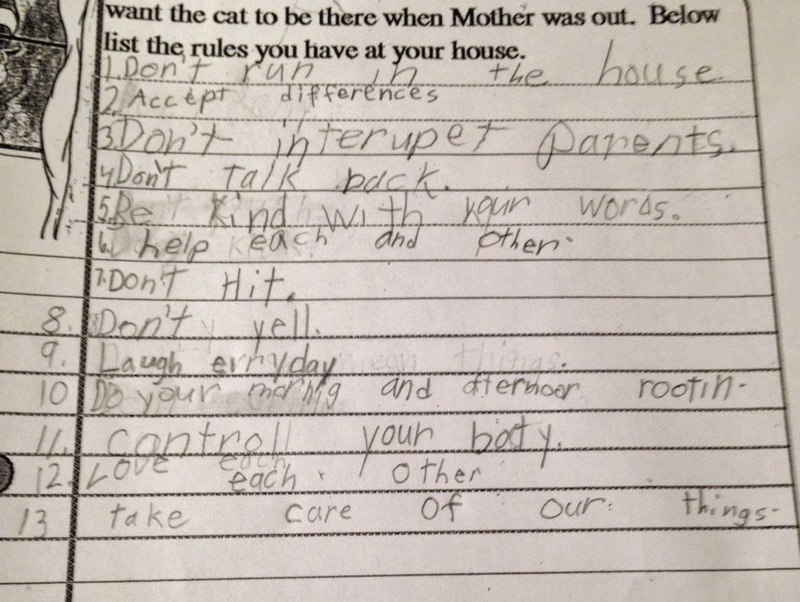 "Mom, What are our family rules?" she asked wasting no time on standard greetings or, even, on giving me any kind of context for this inquiry. "For my homework. I have to write our family rules. What are they?" Forget the that she called while I was driving (again! ), I was mostly annoyed by the fact that she could remember exactly zero of the house rules we've discussed in various forms for years and year and years. "Well," I offered, "you can look at the wall hanging we have in the bathroom or you could use some things from the list we've been working on with Jennie." I'll be honest, I couldn't remember exactly what was on either of these things, but I figured it would get her started thereby leaving me with less work to complete once I was home. Instructions: "The fish in the story was very worried. He did not want the cat to be there when Mother was out. Below list the rules you have at your house." 1. Don't run in the house. 2. Don't criy. 3. Don't interupet parins. 4. Don't talk back. 5. Don't push. 6. Don't kick. 7. Don't hit. 8 Don't yell. 9. Don't say mean things. 10. Don't scrim. 11. Cuntroll your boty. 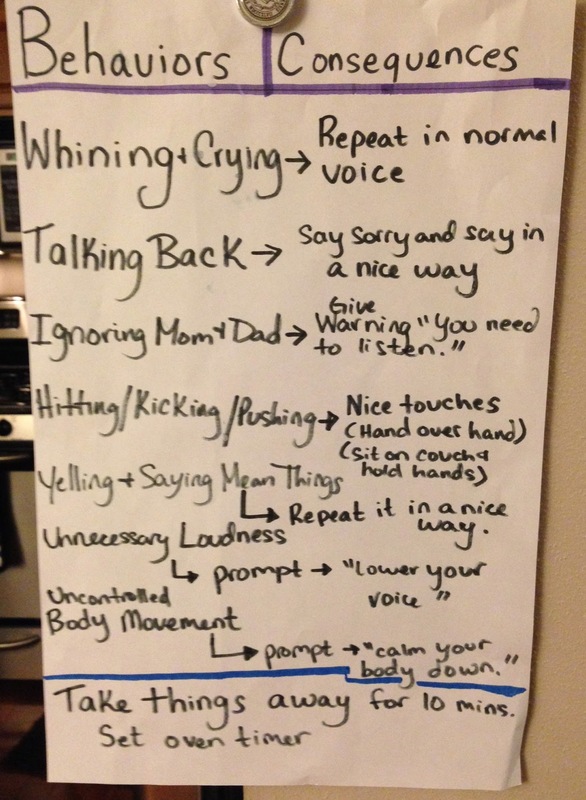 It turns out that Pink opted to copy the behavior/consequence chart that our behavioral therapist Jennie helped us come up with. Only, her spellings is a bit rough. Plus, given that the chart Jennie created was focused on helping us all be on the same page in terms of how we would discipline certain behaviors, it's really focused on the negative. I know I should at least make her rewrite number 11, but I'm torn because it's made me LOL three separate times tonight. And, 10 and 11 taken together call up all sorts of images that include rugby players and theater backdrops. Here's the original chart for reference. Like many things we do, it's meant, really, to help us avoid hours of negotiations with Sky. 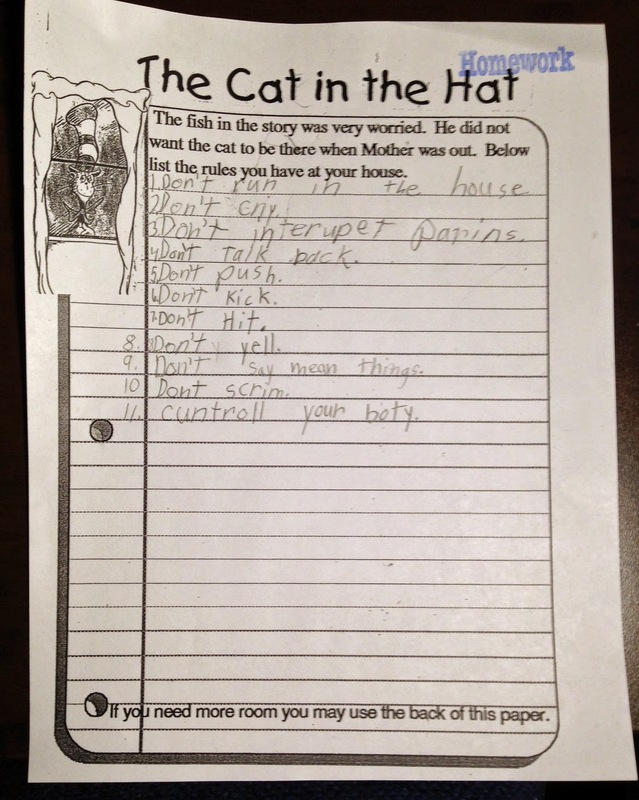 Still, this probably ISN'T the best foundation for a Cat in the Hat homework assignment. I wish Pink had used the wall hanging from the bathroom as her guide (picture below). 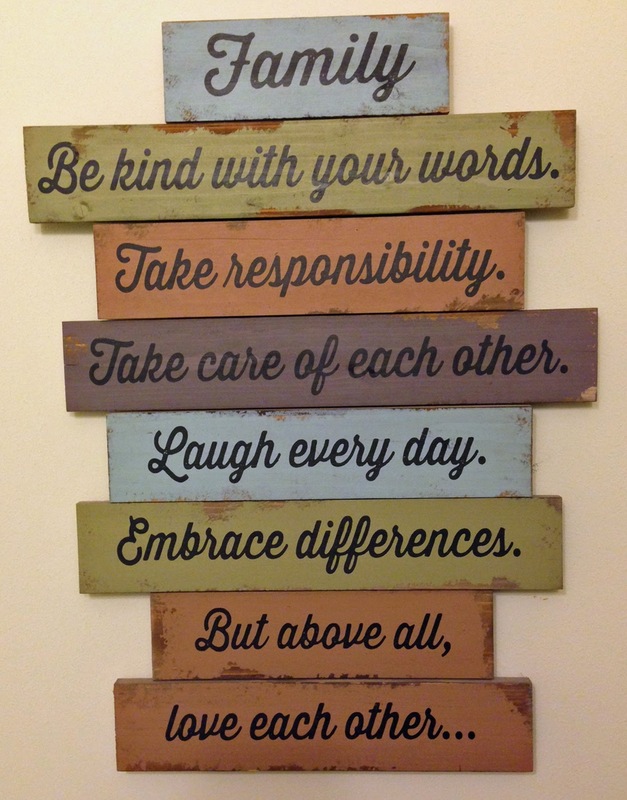 These are the house rules I'm aiming for, even if it does mean we have to work with behavior and consequence charts for awhile in order to get there. Too bad Pink couldn't read (and therefore transpose) the cursive. So, here's the dilemma. Do I wake her up early in the morning and have her erase all of her list in hopes of coming up with a more holistic and less explicitly worded one, or do I just let it fly and see what happens? This reminds me a bit of the time last year, when Pink wrote in her weekly journal: "My grandma and grandpa drink beer. Why do they drink so much beer?" That time, my mom happened to be visiting and supervising homework duty. We agreed that Pink should change "beer" to "soda." Of course, she wasn't great with an eraser back then, so you could still see the word beer pretty clearly underneath the freshly written "soda." I let that one go to school that way, but I wonder if early elementary school teachers have as much fun grading homework as I imagine they do? 1. Don't run in the house. 2. Accept differences. 3. Don't interupt parents. 4. Don't talk back. 5. Be kind with your words. 6. Help each other. 7. Don't hit. 8. Don't yell. 9. Laugh every day. 10. Do your morning and afternoon rootin. 11. Control your body. 12. Love each other. 13. Take care of our things.